Our base for the week, the Beacon House campsite, a small certificated site listed by the Caravan & Camping Club and only ten minutes walk away from Flamborough village. Directly opposite the campsite is Dane’s Dyke, a preserved section of ancient defensive earthworks. Originally over 4 miles in length and completely isolating the headland, this shorter stretch is now open for the public to walk, and leads down to a beautiful white cobbled beach. Soon after arriving we took a walk to the village, and identified no less than four pubs and restaurants, plus two fish & chip shops! We tried out a couple of them during the week for evening meals. Firstly the Royal Dog and Duck where we had reasonable steaks, but worth noting they only take cash, unusually no card payments. Secondly the Seabirds restaurant, sensibly priced and a more contemporary menu. 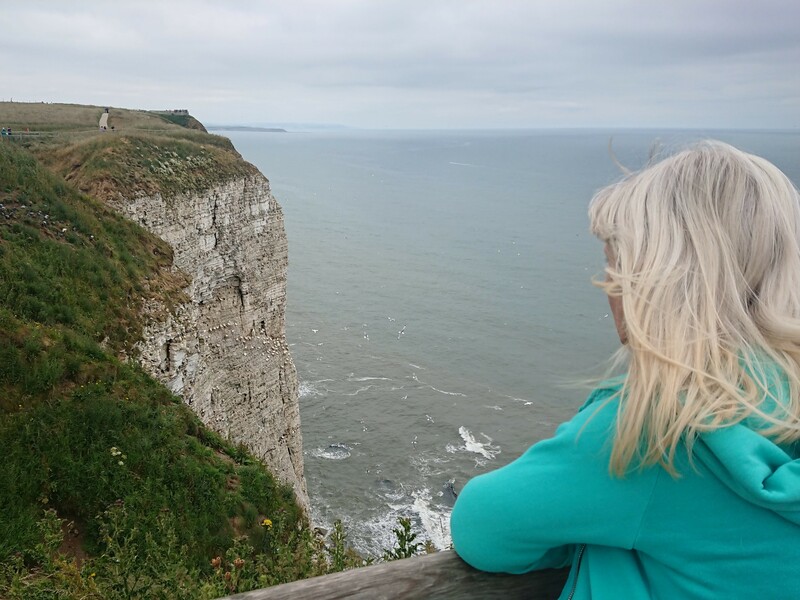 Ten minutes drive away from Flamborough is the RSPB visitor centre at Bempton Cliffs. Grandstand views of maybe thousands of seabirds nesting on the steep white cliffs. We even managed to spot some puffins! A couple of miles drive from Flamborough village takes you to the headland. We explored the area around the lighthouse, and then continued on to North Landing, used for various beach scenes in the recent ‘Dad’s Army’ movie. 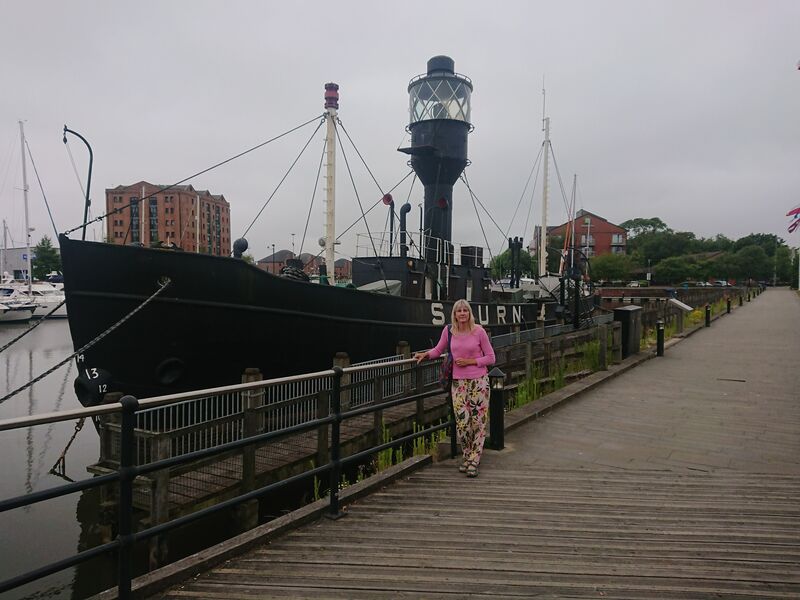 We drove to Filey on the Sunday, but we were unable to find anywhere within reasonable distance of the centre to get parked, so we abandoned the visit and went elsewhere. We made a second attempt later in the week, but found it almost as difficult to park as at the weekend. There appeared to be very little to explore in Filey, which seems geared up to beach holidays, so our visit was rather a short and disappointing one. Beverley, in contrast, is a very pretty market town. Lots to see, all within easy walking distance of the Saturday Market (just the name of the market place – it’s there every day!). 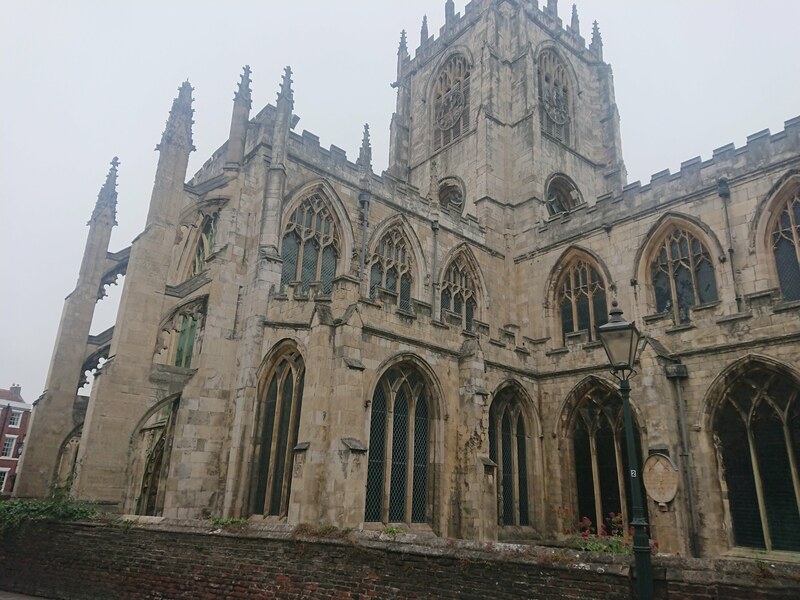 We returned to Beverley one evening later in the week, for a lovely meal at the Thai Palace restaurant which looks directly on to the market cross. We always enjoy looking around model villages whenever we find them, and halfway between Flamborough and Bridlington is the Bondville Model Village. Cheap admission, and a pleasant way of whiling away an hour or so. Bridlington Old Town is about a mile away from the modern centre on the coast, and we enjoyed exploring it in some detail making use of a trail leaflet from the local tourist information office. The High Street was also used as a setting for the Dad’s Army movie. When we visited, the Priory Church was featuring a very moving exhibition by the British Legion to commemorate the centenary of the 1918 armistice. Card silhouettes of soldiers filled the pews of the church, with each one bearing the name of a soldier from the town’s memorial list also found at the church. Hull is an unusual place. Lots of new shopping and trendy bars which I’m sure would appeal to a slightly younger audience. A small museum quarter to explore in the old town area. A pleasant enough diversion for a few hours, but not somewhere that captivated our attentions. Bridlington itself is a lovely seaside resort, with plenty to enjoy for young and old alike. We visited a few times during the week, exploring the ‘new’ part of town, beach promenade, harbour area and nearby shops. Sewerby Hall & Gardens is nearby between Bridlington and Flamborough, with amongst other things a beautiful walled garden and rose garden to explore. There’s something very special about British seaside holidays – that first glimpse of the sea, walking barefoot on the sand, the sound of seagulls, fish & chips, ice creams and souvenir shops. The Flamborough coast gave us all and more! Sometimes life is about seeing new places. Sometimes it's about stepping back and remembering where you've been. My photo diary brings both of these together for me. Enjoyed your tour of the Flamborough area Stuart. I’ve been to Flamborough and Bempton but it was a long time ago. I don’t know Filey at all but interestingly two people I know both have second homes there and seem to adore the town. I’ve visited Whitby and Scarborough a bit further north but not Bridlington. I liked the sound of Beverley but haven’t been and only to Hull years ago to catch a ferry! Thanks for the comments Marion. If you should ever visit Bridlington, be sure to take in the old town as well as the seaside bit!